Putin, Medvedev and the Arab Spring: will Russia's foreign policy end up on the wrong side? Recent demonstrations and mass detentions have served to draw global attention to the domestic manifestations of the 'Putin-Medvedev swap', but not enough effort has been devoted to analysing its implications for Russia’s foreign policy. 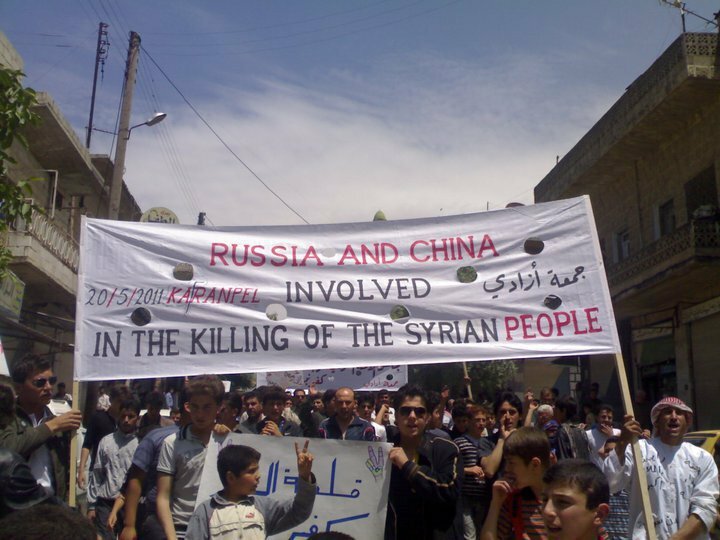 An obvious case in point would seem to be the Middle East and North Africa (MENA), where the Kremlin’s policies could yet generate a wave of setbacks for the country in Syria and Libya. The announcement that the Russian Prime Minister Vladimir Putin will, once again, become President in March 2012 and the ensuing protests have left many commentators bristling with cynicism about Russia’s approach to post-Communist democracy. In spite of the announcement’s show of unity, there have been differences of opinion between Vladimir Putin and his current President, Dmitry Medvedev. Particularly apparent in the policies towards the troubled Middle East and North Africa region, these differing approaches may not be enough, however, to prevent Russia experiencing setbacks in the region. Russia’s stance in Libya may well result in the Russians losing out on lucrative oil contracts. Meanwhile, in Syria, Russia’s posturing could mean that it risks both its reputation with the international community, including the Arab League if the Assad regime stays, as well as with the new Syrian leadership if there is a change of power in the country. Russia has long maintained vital interests in the Middle East and North Africa dating back to the Soviet Era. In a bid to establish spheres of influence, the USSR, alongside other Warsaw Pact members, competed with the US in exporting arms to the region, and Russia continues this practice to this day. As the region developed its capacity for extracting and exporting oil and gas, Russia had an added incentive to maintain and develop relations: it wanted to continue augmenting the presence and influence of its energy companies in the region and, when possible, to maintain high oil prices. Technological prowess was another factor in the relationship. While Russian technological expertise has been declining for some time, contracts for high tech projects in the MENA region are still numerous, from building railroads in Libya to constructing the Bushehr nuclear power plant in Iran. All this adds up to lucrative economic interests for the Kremlin. Russia’s foreign policy today continues to puzzle many analysts. Some speculate that Russia operates mostly according to a post-Cold War, zero-sum logic; it feels threatened by US power and therefore seeks to undermine American actions in the perceived Russian sphere of influence. Others consider Russian foreign policy more sophisticated but indiscernible to Western eyes, owing in part to the lack of transparency in Russia’s decision making. This particularly includes the role of the shady ‘Siloviki’ group - Putin’s former KGB and military allies who are reputedly at the heart of some of the country’s decision-making. A third option is that foreign policy matters little to Russia, and that the particular direction of the country’s external relations is dictated by energy and economic interests, alongside personality politics. It is here that Putin and Medvedev may differ the most, and as such, the differences may become more palpable when the two reverse their positions in May 2012. Superficially, Russia’s foreign policy in the MENA region seems homogenous and singular. A recent Kremlin document, leaked in October 2011 to the Kommersant newspaper, lists some of the government’s perceived successes in the Middle East and North Africa up to June 2011. Concerning Libya, the paper trumpets the achievement of Russian diplomacy at the UN Security Council in ‘strengthening the status of the UN as the foundation of the international legal system to ensure world peace’. In Syria, meanwhile, the government praises itself for being the bulwark blocking international sanctions against Syria and Iran. However, recent apparent splits between Putin and Medvedev suggest a less decisive approach. One example is the much reported incident in May 2011, when Putin condemned NATO’s action in Libya as a ‘crusade’ and President Medvedev implicitly criticised Putin’s stance, calling the Prime Minister’s choice of terminology unhelpful. Were the usually cordial relations between the President and the Prime Minister further strained when Medvedev then sent the Presidential Envoy to Africa and the Middle East, Mikhail Margelov, to Libya in order to mediate between Gaddafi and the rebels? 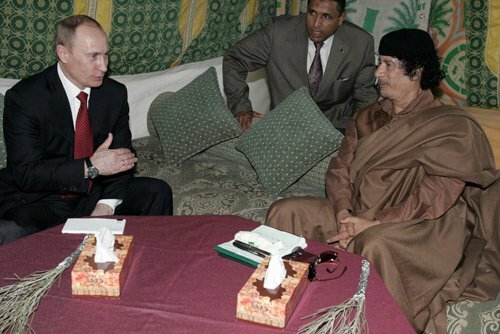 What is clear is that seven months later, with Gaddafi dead and the rebels in power, Russia’s refusal to support the NATO action in Libya may mean that Russia stands to lose out on two levels. Firstly, it may miss out on further lucrative oil contracts in Libya, a country which holds Africa’s largest crude oil reserves. This is important despite the fact that Russia possesses the second largest oil reserves in the world. Today, Russia’s own oil revenues are dwindling, while the budget’s dependence on oil (and its high price) is increasing. Russian companies need the oil contracts in order to expand their industries and profits. The Libyan Transitional National Council’s (TNC) announcement that all the countries that joined the NATO effort to help the rebels remove Gaddafi from power will be rewarded - a list which excludes Russia- must have come as a blow for the Kremlin. While the rebels have acknowledged that previous contracts will be honoured, it remains to be seen whether Russia has a future in Libya in the same way it did before. This leads to a second drawback - that Russia will not be in a position of strength in Libya. As such, it will not be able to deter or eliminate competition for business contracts in the country, while actors such as France now stand to gain access to 35% of the African state’s oil. This damages not only Russia’s stance in one of the most lucrative oil economies in the region but also runs contrary to its long term investment strategy in Libya. Since 2007, Russia has cancelled all the country’s Soviet-era debt totalling $4.5 billion, in exchange for contracts for the construction of railways ($2.9 billion) and supply of weapons ($1.3 billion). If Medvedev’s actions of toning down criticism of the NATO intervention and sending out a support parachute of mediators were attempts to side-step this outcome, they bore little fruit. Russia’s policy on Syria seems to have followed a similar splintered path along the Putin/Medvedev divide. As with Libya, Russia has been investing in Syria for a long time. In 2007, Russia wrote off $3.7 billion of Syria’s Soviet-era debt - 73% of the total amount owed. It subsequently signed a $370 million contract for a gas pipeline, engaged in a preliminary multi-billion dollar contract to build a petrochemical complex and an oil refinery in Syria and, in a move seen to be pandering to the Assad regime, included the Syrian Muslim Brotherhood on Russia’s list of terror organizations. In addition to their historical alliances, Syria holds strategic significance for Russia, namely that its city of Tartus hosts Russia’s only naval base in the Middle East. Lastly and perhaps most importantly, Russia’s arms industry contracts with Syria are worth $6 billion. However, while Putin has staunchly supported President Assad during the recent months of turmoil, when a reported 3,500 civilians have been killed in anti-government demonstrations, Medvedev appears again to have adopted a different line. Since the summer, Medvedev has alternated his references to Russia’s support for Assad with encouraging his Presidential envoy Margelov to host the Syrian opposition for meetings in Moscow, in addition to several visits by the envoy to the region. Since summer 2011, Russia has hosted the Syrian opposition three times in Moscow, most recently in November with Foreign Minister Lavrov, a meeting which marked his highest-level contact with government opponents. Focused on maximising economic benefits from the current situation in Syria, Russia has already managed to alienate the Syrian people. If the regime changes, which looks increasingly likely, this strategy might prove very short-sighted. Photo: LCCSyria / Demotix. All rights reserved. Yet as President Assad’s regime crumbles, rather than disassociating, Russia insists on blocking a UN Security Council resolution on Syria. Once again, Russia seems to be positioning itself to be in a lose-lose situation whatever the outcome: if Assad stays, Russia will be disgraced before the international community as it will be seen as the only lifeline to a violent regime, ostracized even by the members of the Arab League. If Assad goes, the new Syria rulers are unlikely to forgive Russia for blocking the UN Security Council resolution and feeding the Assad regime with weapons used against Syrian protestors. At the most recent meeting with the opposition, the Russians went out of their way to imply that the meeting was not, in fact, organized by the Foreign Ministry (despite the Foreign Minister taking part) but by a lobby group, even adding that Margelov was not acting in his capacity as the Presidential Envoy. The same day, the Syrian Ambassador was also invited for a meeting in the Kremlin. Putin said that the ‘swap’ had been agreed ‘several years ago’, and thus, any interpretations of the situation as a power struggle between Putin and Medvedev now may seem calculated to portray Russia in a less authoritarian light. Whether Medvedev and his team are indeed adding nuances to Russia’s foreign policy in the MENA region remains yet to be seen. Putin said that the ‘swap’ had been agreed ‘several years ago’, and thus, any interpretations of the situation as a power struggle between Putin and Medvedev now may seem calculated to portray Russia in a less authoritarian light. However, this does not explain why Russia risks losing out on key assets with two of its most important contacts in the region. Russia now finds itself in a key position with Syria. As the Economist Intelligence Unit notes in its latest Syria report, the EU and US’s boycott of Syrian oil - 95% of which is bought by the Europeans - has hit the Syrian economy hard. According to the report, Europe’s Syrian oil purchases ‘account for 20-25% of both the total government revenue and of Syria’s current-account receipts, causing an interruption of sales as the government struggles to find alternate buyers.’ Faced with this economic pressure, Syria will continue to rely on Russia and China to veto any condemnatory UN Security Council Resolutions. 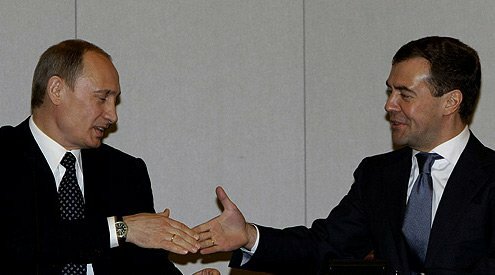 Russia stands to benefit financially in the short term by fuelling Syrian violence with further arms sales: in November 2011, and over the 6 months after violence against Syrian protesters had escalated, the Kremlin confirmed that it will honour all arms contracts with Syria ‘since there are no restriction on the supply of arms’. As Putin and Medvedev swap positions, it is likely that Russia’s more nuanced attempts to approach the situation in the MENA region will disappear. This is not simply because Medvedev will no longer be President - indeed it is not clear that he has been, in fact, the driver of such policies. What is clear is that the dichotomous policies are not far-reaching enough to create a real effect. With mass protests on the streets in Russia, it may be that Russia’s foreign, as well as its domestic, policies will soon come under long-overdue scrutiny.